Q: What is worse than having a bad experience with a company's products or services? A: Having a bad experience contacting the company about your bad experience. @gibsonclan: @ThomasCookUK When flying Thomas Cook god forbid u have a bad experience - customer service does not exist. @ThomasCookUK: Sorry to hear this @gibsonclan Do you have a reference number when you logged your call so it can be investigated further? Thank you. So, it appears that Brad encountered an issue with the Thomas Cook online complaint reporting system. So I opened up Chrome to give it a try. The first thing I noticed is a stated endeavour to respond within seven days. I think that if a company is going to do business on the Internet, people are going to expect a response in less than seven days. The complaint reporting system prompts me to enter a date. I click on the date field in the form to enter a date, and a calendar pops up. 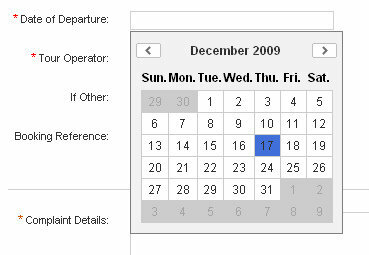 I navigate the calendar and select 17 December 2009. The calendar disappears and the date I selected appears in the date field in the form. So far, good. I then fill in the rest of the required fields and submit the form. An error message is displayed. It appears that the system doesn't recognize 2009 as being between 1970 and 2010. I wonder if Thomas Cook will really consider complaints about travel that took place 40 years ago. 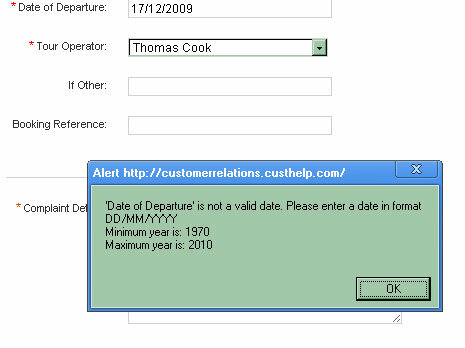 Like Brad, I then try some other dates and repeatedly get the error dialog telling me to enter a valid date. I then try Firefox and can proceed to the next page in the submission process. I hope this form is not an example of the complexity of processes implemented by this company. It is a success. We implemented the automated complaint submission system and complaints went down 20%. We must be doing something right. Right?